No pie this week. We are all sick as dogs and I cannot even imagine making a pie. little post on my homemade laundry soap recipe. 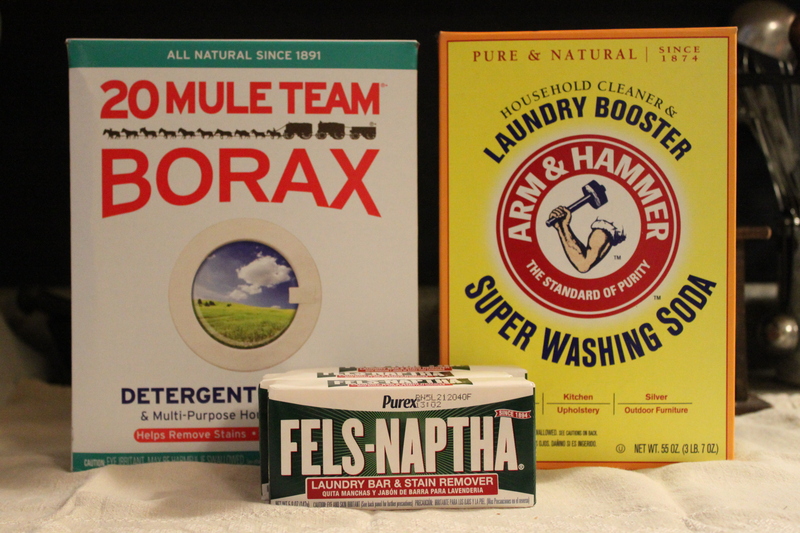 I have been making laundry soap for about 8 years and it’s saved us so much money. The ingredients are very simple and fairly easy to find these days. 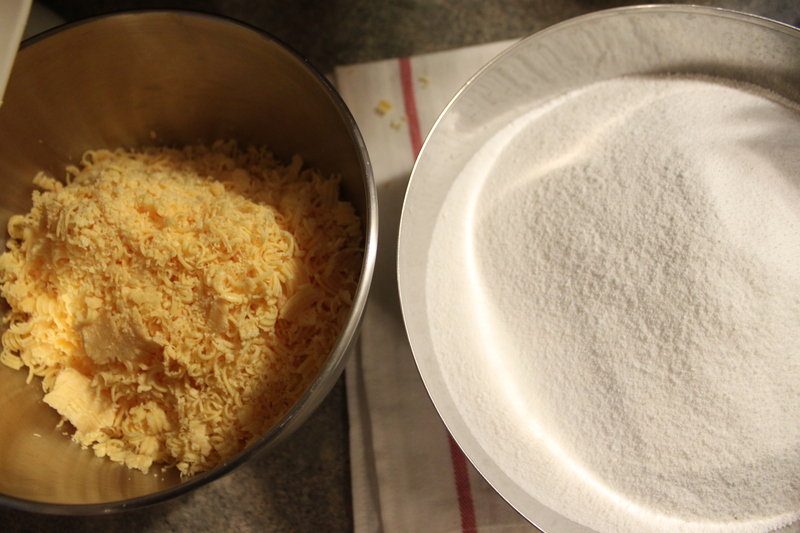 I grate the Naptha soap using my mixer with a grater attachment because, well, it’s easier. 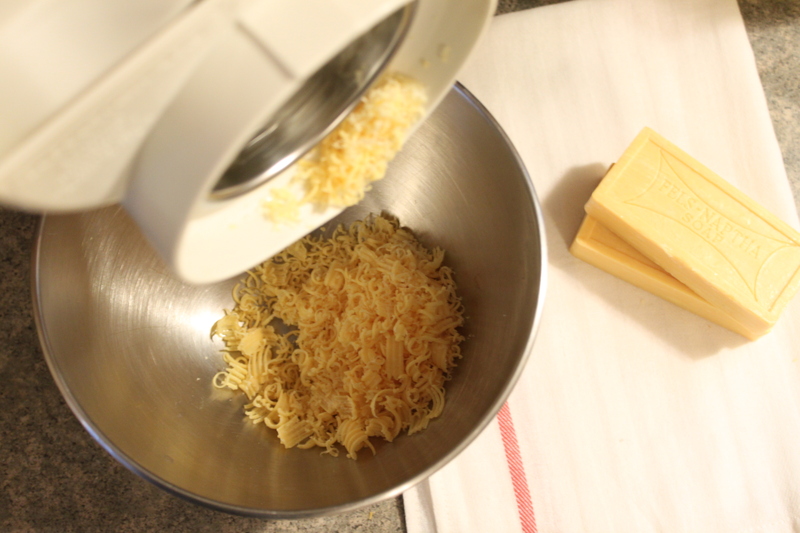 But you can use a cheese grater or even a food processor. and mix it until well combined. This is very concentrated and I only use 2 tablespoons per load. Although we have a massive washing machine which takes two loads at a time so I adjust accordingly. I have seen some recipes which incorporate lavender oil into the mix for scent. That sort of makes it less affordable so I haven’t done that but it sure sounds like a nice idea. the Fels-Naptha looks like grated cheese and can be dangerous if ingested. One step closer to frugal living. I’ve met you before at a MOPS group in YC. And I’ve made your homemade soap before but not quite the way you do. Can you tell me if you’ve tried it in the liquid version? Mine calls for 1 bar, and about 2 cups each of the powders. You melt the bar on the stove, then stir in the powders with some water. Then add that to a 5 gal bucket and fill with water. And that is the CONCENTRATE! So after making it and using it awhile, I was unimpressed with it’s cleaning ability and tried diluting the concentrate less on a 1:1/2 ratio instead of 1:1. This was better but still not impressive. HOWEVER, this wasn’t any worse than my store bought detergent (and I used to buy name brands)!!! So I figured even if it wasn’t great, at least I wasn’t paying $20+/month on detergent that wasn’t any better than my homemade REALLY CHEAP stuff. My biggest issue was that it wasn’t getting the smell out of the clothes. And maybe they were a little dingyer, or that could have been my imagination. I saw a friend using Oxy as a additive and decided to try it. It made a huge difference! So I’ve been adding this every load. When I saw your recipe and how simple it is (and the difference in amounts of ingredients – WOW), I had to comment and ask you what you think about my recipe compared to yours. Do you use any additives? Does it ever NOT melt in the wash and leave a big clump when you pull out the clothes? I have a front loader that only seems to clean so-so (or maybe it’s just my methods), therefore, all my loads go on the longest, hottest cycle for the type. Any ideas you can offer would be appreciated, especially since you’ve been making your own a long time and I just started! Thanks! Hey Samantha, I have never tried the liquid laundry detergent because I’ve read that they tend to congeal. I have however tried a lot of variations of my own recipe to get it correct. In the beginning I used one bar of Fels-Naptha with each recipe. That just didn’t get things clean enough and I noticed that my clothes were still not smelling fresh. Eventually I added three times the amount of Fels-Napa because the cleaning power before just didn’t cut it. That made a big difference. I haven’t added Oxy because my goal was to keep the ingredients as simple and inexpensive, so I played around with ratios of soap for a while instead. I do have a toploader and it is a high-efficiency washing machine, I don’t have any experience using my particular recipe with a front loader. I have never experienced any clumping with mine and I rarely use hot water because of the type of washing machine I have. I’d be interested in seeing if a front loader would change the effectiveness of my recipe. Let me know if you give it a try, so I can add a note about it in the post. Thanks for the comment! Hi! I thought I’d weigh in on this. I’ve been using homemade detergent for a few years now. I used to do liquid, though not a concentrate. I used 1 bar Castile Soap + 1 cup washing Soda + 1 cup borax + 10 gallons water (in an old liquid laundry tub), using the same amount of detergent I normally would. It didn’t congeal, possibly because it wasn’t concentrated. I switched to making just the power version (same recipe, minus the water; 1 Tbsp/load) because it takes up less space (though sometimes I have issues with it not disolving on a cold cycle- I think it’s just because I’m using an he machine & there’s not enough water. It works fine on a non-he machine. I just “melt” the powder in a little hot water first for a cold wash). The smell may be from your washer itself. Try cleaning it (run a hot cycle, large load with no clothes or detergent. 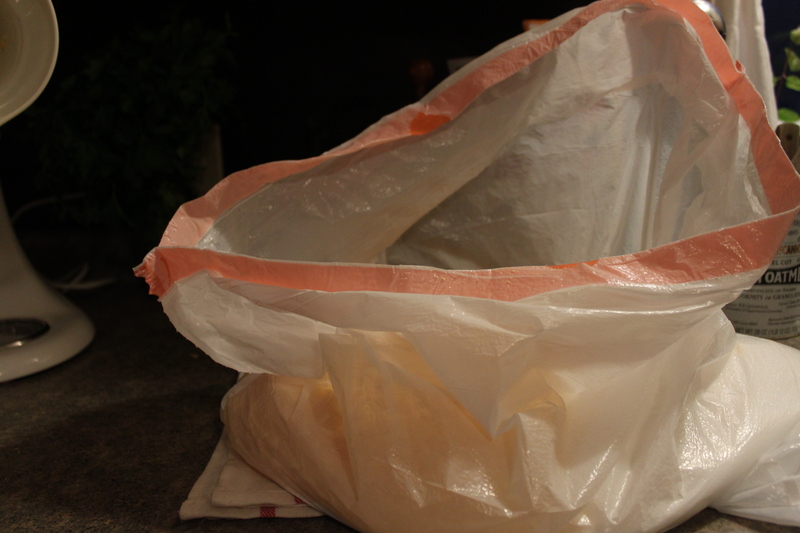 Once it fills with water add 4c white vinegar & 1c baking soda, let it agitate, then let it soak for 30-60 min. Finish the cycle, give it an extra rinse, & let it air dry with the door open). Oh, and if you want to save a little more, you can make your own washing soda by putting baking soda on a cookie sheet & baking at 475 for an hour (I buy baking soda in bulk anyway because I use it to clean almost everything). Samantha- do you still go to MOPs in YC? We are living in YC now and I’ve thought of going, but I don’t really know many people (it’s my husband’s hometown). Hi Jenn, it’s so good to hear from you! How is motherhood treating you? So my washing machine is an HE and it melts just fine so maybe there is an issue of how finely grated the soap is. I really love Castille soap and have thought about using it in my recipe. Great input, thanks so much. I am pretty sure that the MOPS isn’t still going but sometimes Crossroads has MOPS programs I think. I would definitely recommend getting involved in a mom group, they can be such a blessing.